I never really know what projects will catch my eye from one party to the next. That's what really makes it fun! Last week, a whole bunch of recipes were calling my name. This week, you make me want to paint some furniture in big bold colors! 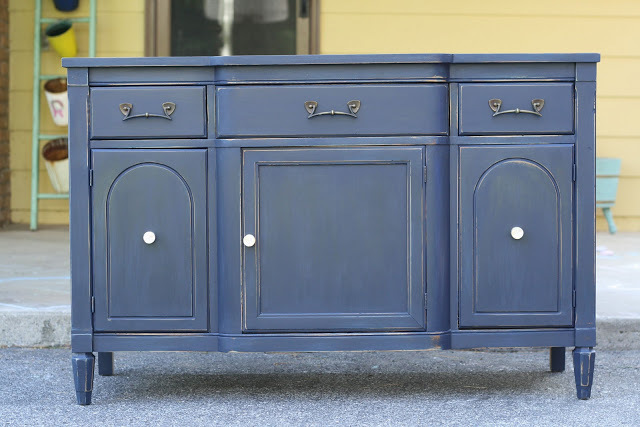 I am just loving the navy blue on this sophisticated coastal sideboard from Cassie over at Primitive & Proper! Does hardware make you swoon or is it just me? 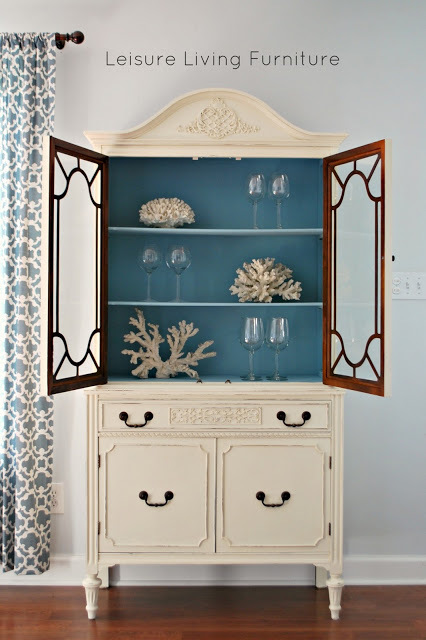 And how pretty is this shade of blue that Lora at Leisure Living used on the inside of this stunning white vintage hutch! After some trial and error, Angela from Number Fifty-Three has found the perfect shade of red. I'm definitely giving this one a try! 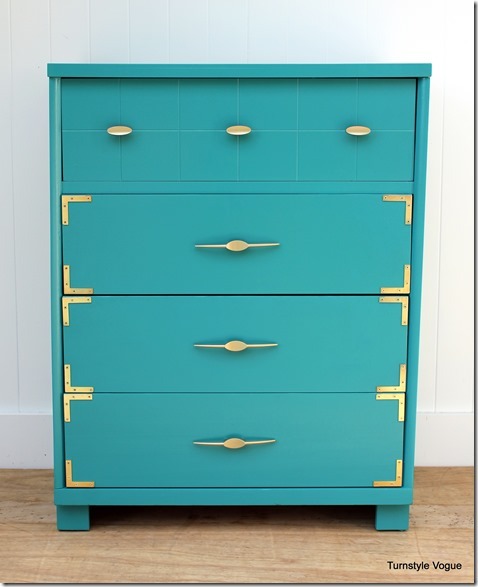 Helen from Picked & Painted created a custom shade of mustard yellow for this gorgeous buffet! And this barn wood coffee table project from Picked and Painted definitely has my wheels spinning! 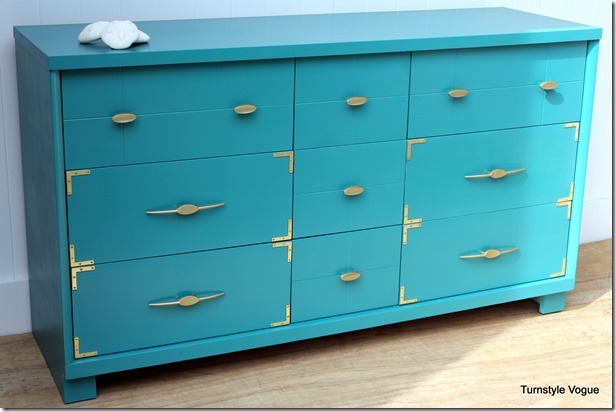 Shari from Turnstyle Vogue chose a beautiful teal shade for this dresser set inspired by the sea. The hardware definitely adds a touch of glam! 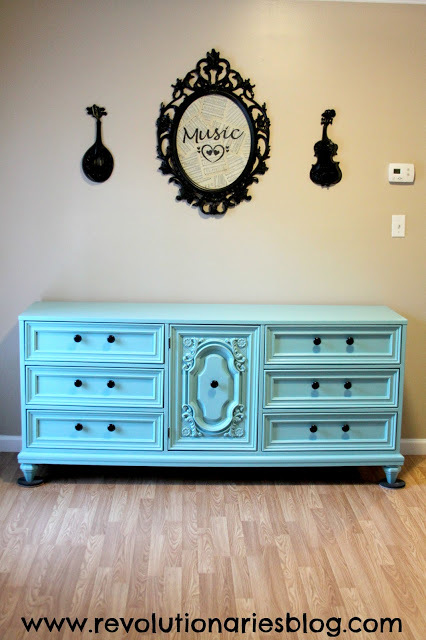 Bonnie from Revolutionaries created a brand new color she's calling aqua mint for this beautiful dresser she painted for a friend! And how soft and dreamy is this antique gray and white wardrobe from Jami at Freckled Laundry! This week we got an upcycling project from The Weathered Door. 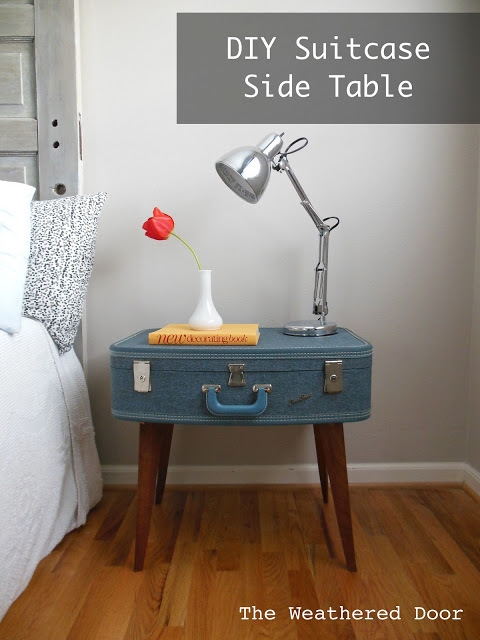 This DIY suitcase side table is just so much fun! 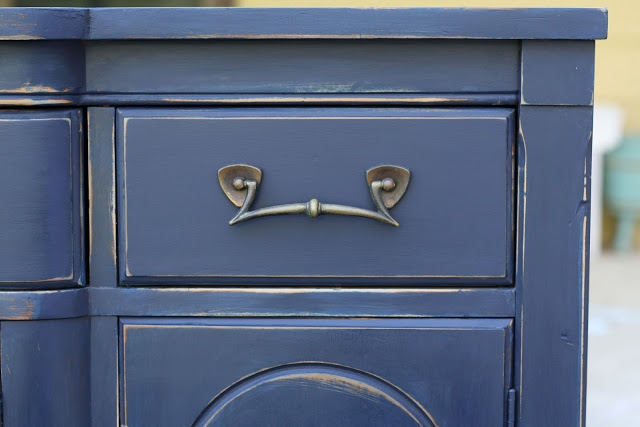 And there are just so many charming details in the beautiful kitchen transformation from Robin at Happy At Home! You really need to stop by and get the complete tour! Hi Sharon I am a new follower to your lovely blog. So glad I discovered you. First time partier as well. Thanks so much for hosting.Have a wonderful week! Blessings! So many wonderful features...looks like I need to check some out. Thanks for hosting. thank you so much for the feature! so many amazing ones- i love picked and painted's projects always, and robin's home makes me smile! i also love shari, and angela! :) so much to say- so many great things in one post! Beautiful features, love all the blues. oh my gosh, i don't know which of those fabulous furniture pieces i like more! thanks for hosting! Thanks so much for hosting! Love all the features! Thank you for hosting. Such pretty colour projects you featured this week - perfect for spring! Thank you for hosting...such great features!! The features for this week are amazing! Oh, How i love that little suitcase! 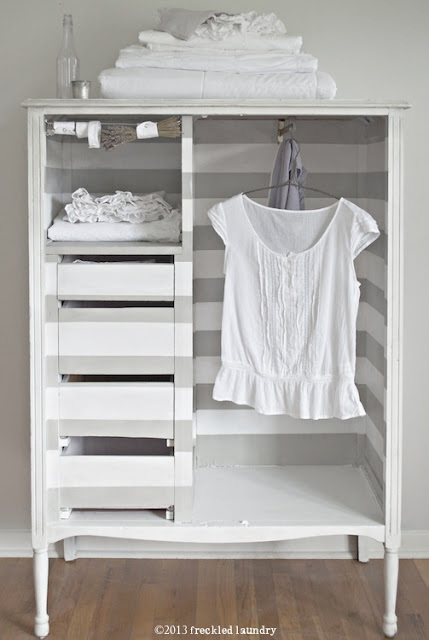 ANd the little girls armoire in gray and white is high on the list of things to do.....so little time! Thanks for the great features! I love all the color you picked this week! Love the gray and white wardrobe, so adorable! Thank you so much for featuring my dresser! I'm with you Sharon...that drawer hardware is fabulous!!! Hi Sharon, thanks for hosting. Such excellent projects featured this week. Sharon, I don't know which feature I like best. They're all fabulous!! Thanks for a wonderful party! WOW! These are ALL great features. You really picked some good ones!I was surprised to see two of my pieces featured....THANK YOU, THANK YOU!!! I loved that gray and white wardrobe. What inspiring furniture ideas you have featured this week. I love having a place to go for good ideas! Thanks for the party, Sharon! So happy to be joining in this week, thank you for hosting! 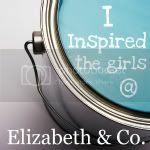 The features from last week are so beautiful...looking forward to all the inspiration shared this week!! Such pretty colors! The yellow one matches my sunny mood today. Happy to be at your link party, Sharon. Thanks for hosting! Such great features Sharon, as always. My favorite is the vintage white hutch. I'm off to do some visiting. Thanks for hosting! Aww, thanks for the feature on my kitchen makeover. You've made my day. Thanks!